Geode-inspired nail art in on-trend this season. 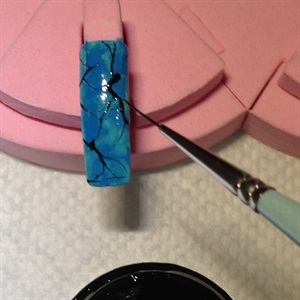 Follow this step-by-step from San Francisco-based nail tech Mia Rubie to help you offer your clients a design that resembles an opaque, blue-green mineral topped with gold. 1. Apply a bright turquoise blue gel to the entire nail. Cure. 2. 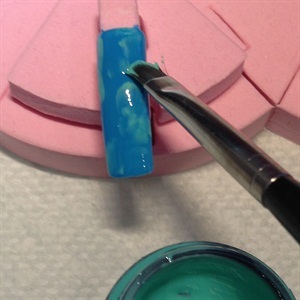 Apply a second coat of the turquoise-blue gel. While the gel is still wet, apply light brush strokes of a medium blue-green gel and blend random patches on the nail. Cure. 3. With a thin liner brush, paint black jagged lines on the nail. 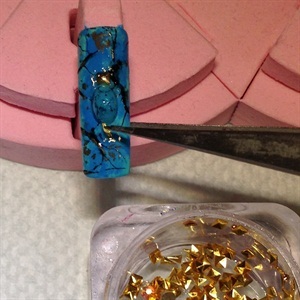 Make some of the lines thin and some thick to mimic the natural pattern of a turquoise stone. 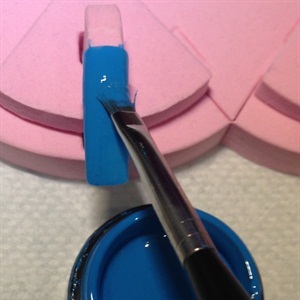 Wipe your brush and gently blend the lines so they are a bit blurry in some areas. Cure. 4. 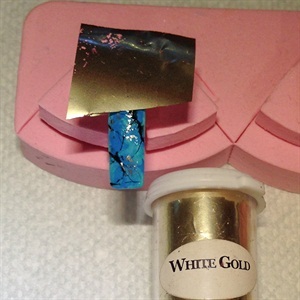 Cut a small piece of gold transfer foil and pat it sparingly over the nail to achieve a metallic effect. 5. 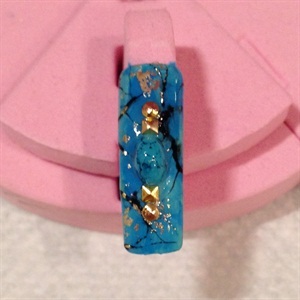 Apply a bead of clear builder gel to the center of the nail and set stones and studs of your choice in place. Cure. 6. To finish the nail, apply a gel top coat over the entire nail and cure. To keep up with Mia’s work, make sure you follow her on Instagram @superflynails.